Michael C Ruppert was a whistle-blower on US government drug-running before becoming one of the most prominent figures in American fringe politics. He has since been on the leading edge in the movements for "9-11 Truth" and Peak Oil as well as other controversial public issues. He (apparently/likely) committed suicide on April 13. 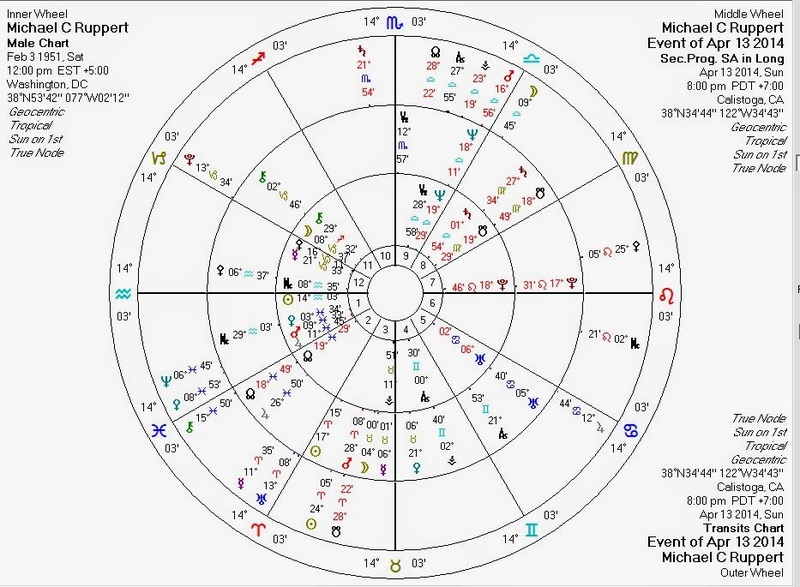 In his astrological chart, a time of birth would clear up a few things, but even without it we can observe some interesting correspondences with his life. Libertarian: Pallas conjunct Mercury and ruled by Saturn which is sesquiquadrate Sun. Authoritarian: Pallas quincunx Pluto and trine/parallel South Node. The configuration in full suggests a very high degree of ethical awareness, but one which is subject to potential lapses. This is sort of a "reverse whistle-blower" configuration: whistle-blowers usually have Pallas configured with the North Node rather than the South. The Nodes are very powerful, but often inconsistent in effect. Capitalist: Venus ruled by Jupiter which is conjunct North Node and by Neptune which is quincunx North Node. Communitarian/Leftist: Venus quindecile South Node and sesquiquadrate Neptune. 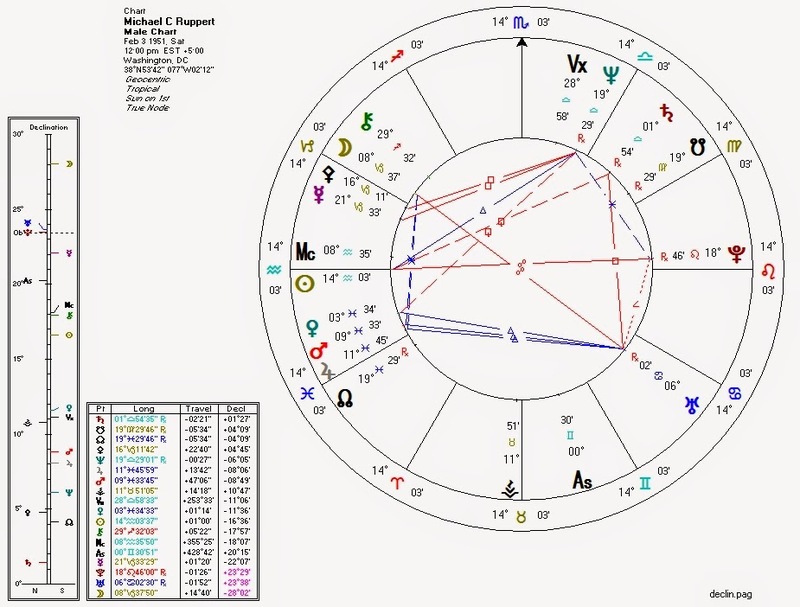 Mars conjunct Jupiter, trine Uranus: vigorous public activity on social issues? Saturn square Uranus: struggles against authority. Rebellion. Mercury square Neptune, quincunx Pluto, and quindecile Uranus: Speaking on secret/taboo/controversial topics; unorthodox views particularly regarding powerful entities and conspiracies. Moon (probably) conjunct Pallas: consistent with a "fighter" and former police officer. Moon (probably) square Saturn: consistent with emotional depression. Sun opposite Pluto: a lifelong battle against deadly power? Neptune heavily aspected: emphasis on spirituality? Aquarius Sun + Capricorn Moon: this combination is held by Matt Savinar to be correlated with leaders in large-scale social movements. Here is a chart for the approximate time of his death. Transiting Mars is conjunct Ruppert's Neptune and transiting Neptune is conjunct Ruppert's Mars. This evokes a picture, perhaps, of action leading into the unknown. And of course: stationing Pluto is conjunct Ruppert's Pallas and transiting Jupiter is opposite. Ethical crisis, life/death decisions, and compromised impulse control. The transiting Jupiter opposition often appears specifically during suicides. Watch RT's Abby Martin's personal tribute to Ruppert. P.S. : 9/27/2015 not shown is Ruppert's Ceres which at 3 Aquarius is quintile his progressed Sun and probably square his progressed Moon. Ceres/Sun/Moon patterns tend to appear when people "go away".